One of the newest tricks to the scooter scene would have to be the kickless rewind. Hated by some and loved by others the kickless is seen at almost any skatepark you go to. There’s a few tips and tricks to learning the kickless that I’ll go over with you. If you’re struggling with this trick read the following tips and check out the helpful video! The first thing you should be able to do is heelwhip rewind. This will help you to understand the motion better and help you when you go to land the kickless. 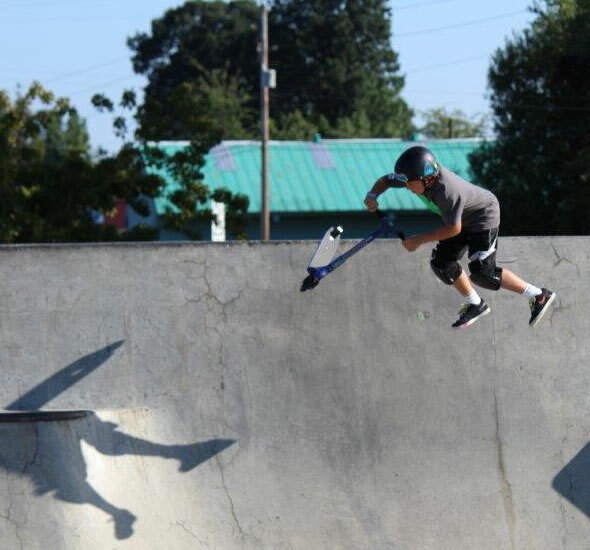 You need to have a good flyout ramp where you can get lots of air. The kickless is 99.9% arm strength. The hardest thing for people is understanding the motion of the kickless. Once you kick out the heel whip you’re going to need all the strength in your arms to push the deck back to your feet without kicking it (hints the name “kickless). Practice the motion a ton of times flat and make sure you have it down. One of the biggest tips I can give you is when to use your strength to push the deck back. The instant after you throw the heelwhip you need to throw the deck back the other way. Don't wait till the heelwhip is close to your feet to do the kickless, it won't work. You have to do the kickless right when you throw the heelwhip.